When you need to find movers in Plano who get the job done right the first time, trust none other than Green Van Lines. Your successful relocation is important to us, which is why we put our best Plano movers on the job just for you. Even if you’re only moving across the city, it can still be a pretty big deal for most families and businesses. Our professional Plano movers will help determine exactly what you would like to pack in our eco-friendly trucks, making your job much easier. We can pack, load, and unload everything for you. A long distance move is often even more stressful than a local move. The simple logistics of transporting an entire family or office, furniture, and other goods can be overwhelming. Our friendly customer service representatives can take on some of your burdens and help plan the trip out for you. Looking to move your valuable car collection? Green Van Lines has a line of safe and secure transportation trucks designed to handle numerous vehicles. 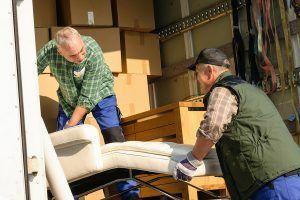 Our movers in Plano are extremely careful when it comes to loading and unloading every vehicle we handle. Moving an entire industrial complex or retail business is simply too much for a single person to handle. Let Green Van Lines take on some of the load with our comprehensive moving services and on-site project managers. We can pack your necessary tools, vital documents, and the whole company for you. If your family is growing quickly, it may be time to move into a new house. Green Van Lines’ Plano movers can help pack your furniture, artwork, and household goods into a truck and transport them to the new home. We’ll also help unload, ensuring you are prepared for a brand new life without too much stress. Relocating a corporation requires the type of logistics only a professional moving company can handle. Think about it; there are documents to pack, electronics to load, and people to relocate. Green Van Lines excels at organizing corporate moves. If you’re in the area, visit our Garland branch at 4417 Forest Lane, Garland. We’d be happy to assist you with your upcoming move. Quick and efficient. Very professional. Fantastic all the way around! Plano, a small city in Collin County, is just twenty miles northeast of Dallas. With a population of over 269,000, Plano has become an affluent hub for Pizza Hut, Huawei, HP Enterprise Services, and Toyota Motors USA. The economy is booming, and tourism is on the rise in beautiful Plano. Give Green Van Lines a call today at 888-770-4733. We’re here when you need us the most!